Celtic Quick News started as an online forum for the supporters of the Glasgow football giants, a place where fans could come and exchange their views on the issues affecting Celtic Football Club. Now it is at the forefront of a social media revolution that has changed, forever, the way Celtic supporters follow their team. CQ Magazine is the next phase in that revolution, bringing together the best writers in Celtic cyberspace. CQ Magazine is brought to you by 241 Media, and will be published monthly. A publication by the Celtic supporters, for the Celtic supporters, it will follow on from the Celtic Quick News format in making the voices of the fans heard. 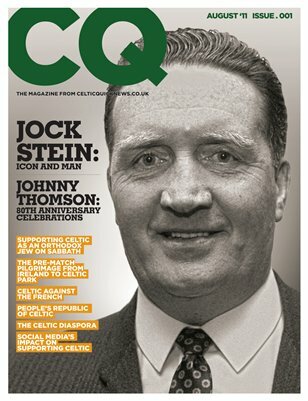 Our first issue has the great Jock Stein on the front cover, and contains a feature celebrating the life of goalkeeping legend and hero John Thomson. Available on Calameo for digital reading and download, and available to buy in print from Magcloud, no Celtic fan should miss it.